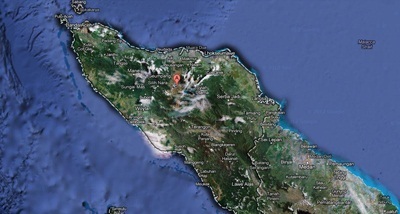 Aceh is one of the special region of Indonesia, located on the northern tip of Sumatra Island. Banda Aceh, the capital city of Aceh located near the Andaman and Nicobar Islands of India and separated by the Andaman Sea. Sabang is a city located in the northernmost position of Banda Aceh on the northern tip of Sumatra. Actually, the name of the island is Pulau Weh (Weh Island). The island is famous for snorkeling and diving activities. A pile of beach sand: Quiet Along the coast you will find a wide variety of turtles. The sand is clean, and quiet atmosphere make the days here are very natural and relaxed. Lampuuk beach with most of the same characteristics in the Aceh coast, stretching from north to south. In the past, before the tsunami happened, this beach was very crowded with fresh fish traders, and famous places to eat (restaurants), which offered to bake and roast fish to be enjoyed by visitors to the beach.